For those who want to build their own custom stroker Chevy small-block crate engine, this partial engine comes with the specially modified block, 3.80" forged steel stroker crankshaft, heavy-duty connecting rods, hypereutectic pistons, bearings, oil pan, oil pump, front cover, balancer, and 12.75" flexplate. 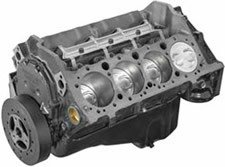 This partial engine does not include a camshaft, lifters, timing chain, or cam sprocket. The oil pan is assembled loosely on the block so it can be disassembled without destroying the pan gasket. 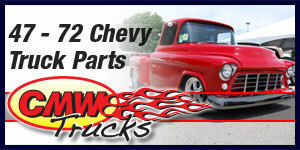 All parts needed to complete the Chevy crate engine are available from your GM Performance Parts dealer. NOTE: Distributor with melonized steel gear MUST be used with long blocks and partial engines with steel camshafts, or engine damage will occur. We recommend HEI distributor P/N 93448806.